Achieve a superior level of clean in smaller applications with the cordless, battery-operated Bulldog Floor Scrubber. 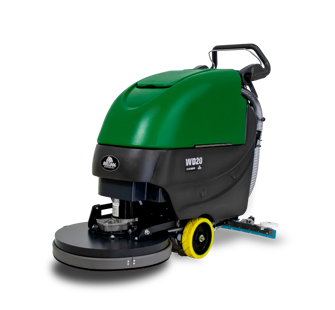 This highly maneuverable, heavy duty and compact walk behind scrubber has been designed to withstand daily use in tough environments. The Bulldog is high quality, hardworking, American-made construction that you can depend on. Increase the productivity of your cleaning routine substantially with the Bulldog Floor Scrubber. By cleaning floors at a rate of up to 20,000 square feet per hour, the Bulldog saves time and money. The Bulldog emulsifies dirt and removes other stubborn residues with ease using powerful down pressure and its high speed rotating brush. Its unique, stainless steel squeegee with urethane blade and strong vacuum system remove excess moisture from floors leaving them clean and dry in a single pass. Clean floors in a more hygienic manner by utilizing the clean water technology of the Bulldog Floor Scrubber. Operator-friendly features make the Bulldog a breeze to operate. Easy access to the recovery tank, clear hoses that allow the operator to visualize water levels, automatic water start/stop, and automatic brush start/stop are just some of the Bulldog’s operator-friendly features. Wheel Driven Forward and Reverse give the Bulldog even brush pressure for maximum maneuverability and productivity. Maintenance has been simplified with automatic brush install/removal.